Global property startup Propy is launching a pilot program with the city clerk’s office in South Burlington, Vermont, where it is using blockchain technology to record real estate conveyance documents, that is, paperwork related to the transfer of property ownership. Propy CEO Natalia Karayaneva told Inman that leveraging blockchain, a secure, distributed ledger, stands to shrink the recording of real estate transfers to half the usual time, and she is expecting other counties in Vermont to hop onboard the program. The South Burlington-Propy pilot includes the local legal team of Gravel & Shea, a group of attorneys that looks at the legal aspects of commercial development using blockchain technology. It also includes Purcell International, a consulting firm specializing in technology, startups, and government/community liaison. “The City of South Burlington is always interested in taking advantage of technology that enhances its delivery of services to residents. We are ready to learn from this Propy pilot,” said Donna Kinville, City Clerk at South Burlington. Propy’s blockchain-enabled platform currently comprises an online and mobile global real estate property store and peer-to-peer marketplace, a transaction recorder for the remote handling of fiat and other cryptocurrencies, and a land records registry that is globally applicable and free of jurisdiction. 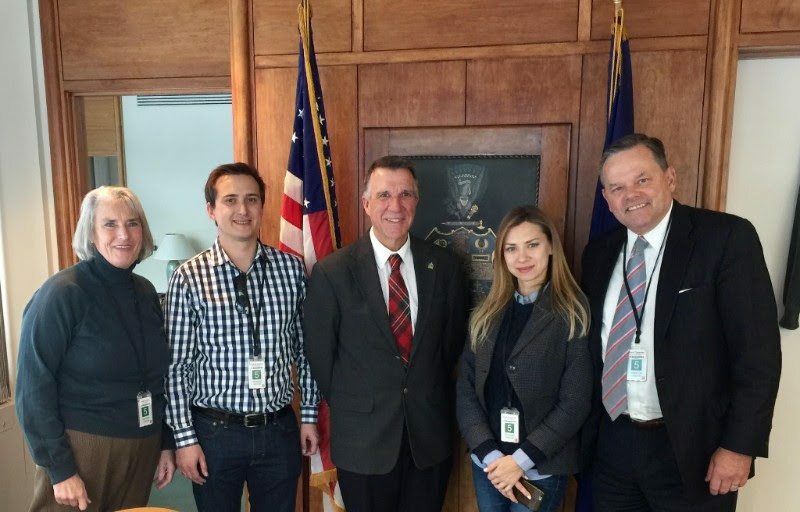 Though Propy is Silicon Valley-based, Propy chose Vermont for its first pilot in real estate transfers because the state was the first to launch blockchain legislation. Propy will likely target other blockchain-friendly states for future pilots, starting with Nevada, Arizona, Delaware and Illinois, said the CEO. Karayaneva told Inman that the conversations about cryptocurrencies and blockchain are becoming easier as they become more high-profile. The fear from agents has been that the technology would disrupt their business, but now they are excited about certain elements, such as proof of payment. “Our strategy has been to empower brokers,” said Karayaneva. Propy Chief Technology Officer Alexander Voloshyn said that concerns loom in the industry about wire fraud, and that blockchain, which powers digital currencies such as bitcoin and ethereum, is a solution to that. Brokerages have wanted to know how to transfer a big amount of money using bitcoin — one concern they had was that if you mess up the address of the bitcoin, you will lose the money forever — said Voloshyn. Propy has solved this by issuing certificates of verification which send a small amount first, he told Inman. Propy, which launched in 2016, now has 20 staff members. It raised $15 million in cryptocurrency last September, the majority of which the company has held onto as cryptocurrency in the form of bitcoin, ethereum and ripple. The funds are now worth $30 million or $40 million USD, according to Karayaneva.